For those interested in 'how we got here' sort of Social History these CD's are made for you- or as an unusual gift for someone else! These are not available in any shop or store! Propaganda has been with us in various forms since the days of the Caveman when he scratched images on good hunting sites, or placed a curse on a cave. Although WW2 offered considerable Propaganda opportunities to all sides, far more interesting was the propaganda involved in between the Wars. This CD covers the rise of the Soviet State, battles of the Wreimar Republic, and the social unrest and upheavals worldwide - plus of course a wide selection of WW2 materials - and post-war activities. Over 150 illustrations. This CD covers the fascinating developemnt of packaging and graphic design form the late 1880's through to modern times. It covers the introduction of plastics, aluminium and much more. A real treasure trove of commercial packaging memorabilia with serious historical and company notations. No single medium has made such an impact on societies everywhere as the Poster. This CD covers the early and simple typographic approaches to the era of Jules Cheret and onwards to modern times. A host of historical and graphic reference materials each briefly notated to relate to the events covered. The development of the automobile was one of incredible fertilty of ideas - some practical - many not. This CD explores some of the curious and odd vehicles and events that accompanied the progress. Some 150 illustrations and comments are included. Part 1 covers from the earliest experiments through to the mid-1920's. Curiosities didn't change after the mid-20's as the car developed. As engineering advanced - styling became more and more bizarre. Greater efforts than ever were made by hundreds of manufacturers to gain business. Some - many in fact didn't make it, but one could certainly say they died trying! In Part 2 - some 150 illustrations cover many of these events. For the fans of Two-wheels whether motorised or pedal-power! An array of graphic design across the 20th Century covering many brands that have since disappeared. Completely notated, dozens of examples are explored. How did the famous brands come about? Where were the names derived from? What do they mean? This CD explores several dozen of the world's most famous brands and comes up with soem surprising and often fascinating answers! A Gem of a gift for anyone involved in Advertising or Marketing generally! 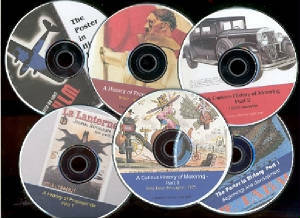 AIT Social History CD's are produced and edited by Norman Clark and all materials shown are believed to be in the Public Domain, and they are presented as documents of social and historical interest. They are not offered for copying or reproduction purposes and no inference is provided that Copyright rests with Norman Clark for any individual item.- other than for the work as a whole. Anyone wishing to use the images should make every effort to find the appropriate copyright holder to obtain permission for such action.